On this day when the dead are celebrated and remembered with the ofredas of Dia de los Muertos or the liturgy of an All Souls’ service, I thought it would be pleasant to recall the Legend of the Obedient Dead Nun. Nuns, of course, take vows of poverty, chastity, and, most importantly, of obedience. A nun’s Superior stands as Christ’s representative on earth and she must be obeyed as one would obey God Himself. It can be a most difficult vow to keep—particularly if you are dead. IT was after she was dead, Senor, that this nun did what she was told to do by the Mother Superior, and that is why it was a miracle. Also, it proved her goodness and her holiness—though, to be sure, there was no need for her to take the trouble to prove those matters, because everybody knew about them before she died. My grandmother told me that this wonder happened in the convent of Santa Brigida when her mother was a little girl; therefore you will perceive, Senor, that it did not occur yesterday. In those times the convent of Santa Brigida was most flourishing—being big, and full of nuns, and with more money than was needed for the keeping of it and for the great giving of charity that there was at its doors. And now, as you know, Senor, there is no convent at all and only the church remains. However, it was in the church that the miracle happened, and it is in the choir that Sor Teresa’s bones lie buried in the coffin that was too short for her—and so it is clear that this story is true. The way of it all, Senor, was this: The Senorita Teresa Ysabel de Villavicencio—so she was called in the world, and in religion she still kept her christened name—was the daughter of a very rich hacendado of Vera Cruz. She was very tall—it was her tallness that made the whole trouble—and she also was very beautiful; and she went to Santa Brigida and took the vows there because of an undeceiving in love. The young gentleman whom she came to know was unworthy of her was the Senor Carraza, and he was the Librarian to the Doctors in the Royal and Pontifical University—which should have made him a good man. What he did that was not good, Senor, I do not know. But it was something that sent Sor Teresa in a hurry into the convent: and when she got there she was so devout and so well-behaved that the Mother Superior held her up to all the other nuns for a pattern —and especially for her humility and her obedience. Whatever she was told to do, she did; and that without one single word. Well, Senor, it happened that the convent was making ready, on a day, for the great festival of Nuestra Senora de Guadalupe; and in the midst of all the whirring and buzzing Sor Teresa said suddenly—and everybody was amazed and wonder-struck when she said it— that though she was helping to make ready for that festival she would not live to take part in it, because the very last of her hours on earth was almost come. 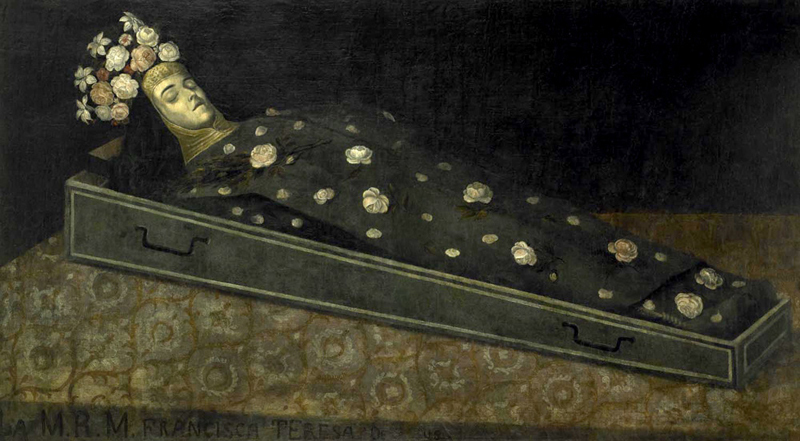 And a little later—lying on her hard wooden bed and wearing beneath her habit the wired shirt of a penitent, with all the community sorrowing around her— Sor Teresa died just as she said she would die: without there being anything the matter with her at all! Because of the festival that was coming, it was necessary that she should be buried that very night. Therefore they made ready a comfortable grave for her; and they sent to the carpenter for a coffin for her, and the coffin came. And it was then, Senor, that the trouble began. Perhaps, because she was so very tall a lady, the carpenter thought that the measure had not been taken properly. Perhaps, being all so flurried, they really had got the measure wrong. Anyhow, whatever may have set the matter crooked, Sor Teresa would not go into her coffin: and as night was near, and there was no time to make another one, they all of them were at their very wits’ end to know what to do. So there they all stood, looking at Sor Teresa; and there Sor Teresa lay, with her holy feet sticking straight out far beyond the end of the coffin; and night was coming in a hurry; and next day would be the festival—and nobody could see how the matter was going to end! And then, Senor, before the eyes of all of them, Sor Teresa slowly began to shrink shorter —to the very letter of the Mother Superior’s order and command! Slowly her holy feet drew in from beyond the end of the coffin; and then they drew to the very edge of it; and then they drew over the edge of it; and then they fell down briskly upon the bottom of it with a sanctified and most pious little bang. And so there she was, shrunk, just as short as she had been ordered to shrink, fitting into her coffin as cozily as you please! Then they buried her, as I have told you, Senor, in the comfortable grave in the choir that was waiting for her—and there her blessed shrunken bones are lying now.